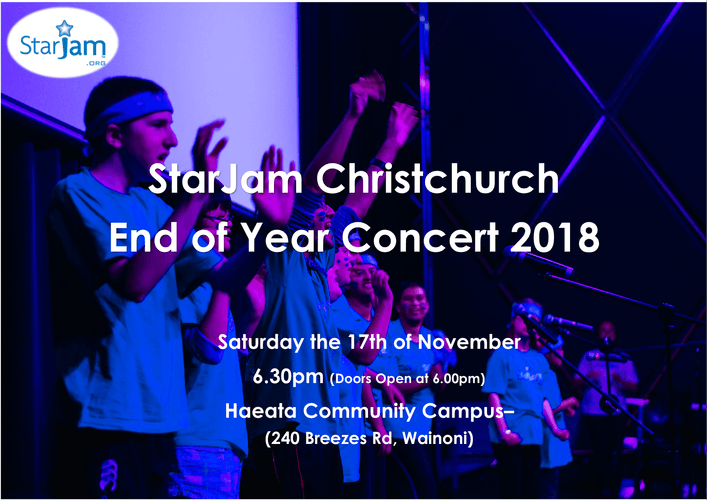 StarJam empowers young people with disabilities through performance opportunities here in Christchurch and nationwide. Through StarJam, hundreds of young people with disabilities are empowered, supported, extended and welcomed into a space where the focus is always on what you can achieve, not what you can’t. Our 2018 End of Year Concert, is the culmination of a year's worth of efforts from our young people. Prepare to be swept up in an evening filled with sensational singing, dazzling dancing, dynamic drumming and joyful jamming. A StarJam show never fails to entertain, inspire, and surprise. Come along and support our young people – it’s an evening for the whole family. Bring cash to enter our raffle for some wonderful prizes. Proceeds from this event will be donated to the StarJam Charitable Trust.